Lisbon Portugal (Lisboa) is located on the Tagus River, not far from the Atlantic Ocean. 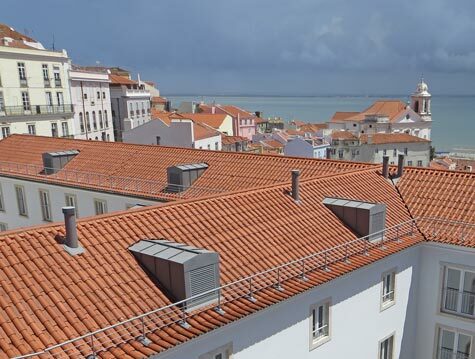 Tourist attractions are concentrated in three Lisbon districts: Alfama, Baixa and Belem. Other top attractions can be found in the modern city and along the west coast. Top attractions in the Alfama District include St. George's Castle, the cathedral and the ancient Roman Theatre. Baixa is the historic heart of Lisbon. It features three lovely squares and some great architecture. Belem is home to a massive monastery, the Royal Palace, several museums and the botanical gardens. Other top attractions include Europe's largest mall, the Estadio da Luz sport stadium and a massive suspension bridge. The Portuguese Riviera is a short drive west of Lisbon. Explore the towns Estoril and Cascais and some amazing beaches! Comprehensive information regarding the Lisbon Airport, train stations, cruise port and public transit (metro, street cars, ferries, funicular).